Another great Instagram shot came from 3monkeysamps. This time it’s a photo of Brad Whitford’s current pedalboard. 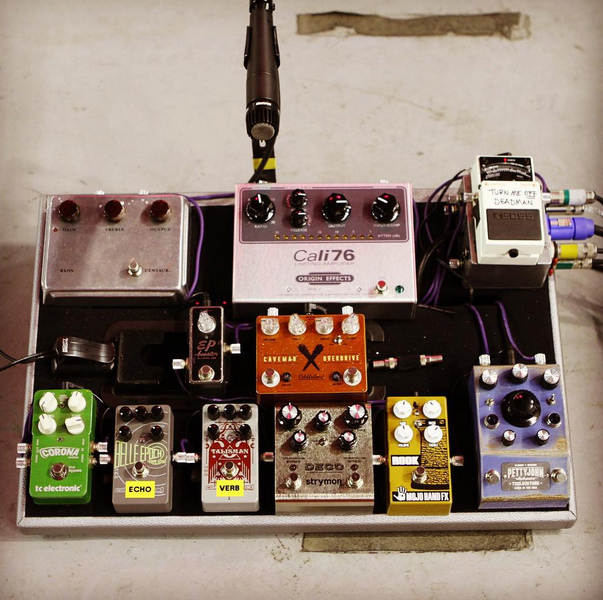 I’ve done a few posts about his pedals before, and he’s the type of musician that is always trying out new pedals, so it’s fun to see what’s new on the board. Brad has used the Klon Centaur for a long time, and has been a backer of TC Electronic and Mojo Hand FX for a long time. Items that are new since my last posts are the PettyJohn, Oddfellow and Origin Effects. Check it out. So.. what do you think the SM57 microphone is all about? Some chatter to pick up ‘open’ guitar.. not sure. Let me know what you think by commenting below! The mic, could be an ambient mic for the IEM. Having an open mic or mics on stage helps get rid of the isolated feeling, and helps get a sense of your live sound from the amp itself, along with the mic'd signal. Mic might be there and out of phase to cancel out ambient noise from backing vocals.